Famed Speyside distillery The Macallan and legendary crystal maker Lalique are coming out with their latest highly-prized collaboration in time for the holidays. 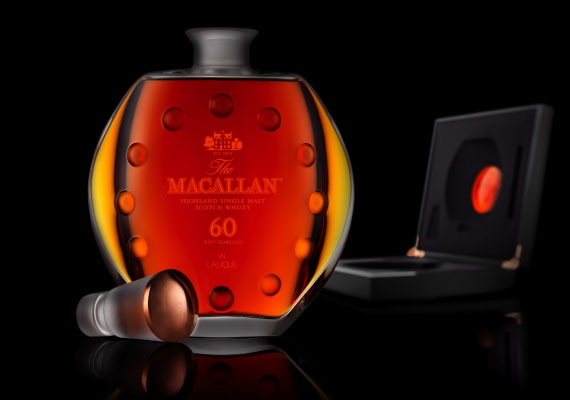 The Macallan in Lalique Curiously Small Stills decanter, the fourth in the covetable series of single malt presentations, contains an exceptionally rare 60-year-old whisky. Limited to only 400 numbered pieces worldwide, with only 72 of those destined for the U.S. in December, the decanter is based on the distillery’s distinctive copper stills, Speyside’s smallest, and is priced at $20,000 apiece. The spirit was drawn from five sherry casks, made from a mix of Spanish and American oak, filled in 1950.